Little has changed in the U.S-Bolivia relationship since each expelled the other’s ambassador and suspended full diplomatic ties in 2008. Last month a Bolivian official accused the United States of trying to sabotage the administration of President Evo Morales, and Morales has not dropped his pugnacious anti-U.S. rhetoric. Washington, for its part, has persistently criticized Bolivian anti-drug policies, while not acknowledging the failures of its own decades-long “war on drugs.” As discussions surrounding Secretary of State Kerry’s January 24 confirmation hearing suggested, U.S. policy toward several Latin American countries – including Bolivia – is still on Cold War autopilot, continuing to use code-words like “socialism,” implicitly and incorrectly viewing the recent and historic changes in that country largely through the prisms of Venezuela and Cuba. Along with many observers outside of Washington, the Bolivian government understands itself to be addressing long-standing demands to correct a historical lack of social inclusion, to institute a more participatory (and “plurinational”) democratic process, and to pursue economic sovereignty. In notable contrast to Venezuela, with which Bolivia is often lumped together, the country’s long-marginalized indigenous majority is in the national political driver’s seat for the first time. Despite Morales’s rhetoric to the contrary, Bolivia is far from rejecting the free market. It recently applied for full participation in MERCOSUR, and has welcomed foreign investment in its sizable petroleum and lithium deposits. Along with Peru and Ecuador, Bolivia has also sought ways to maintain economic growth while protecting the environment and avoiding unsustainable extractivist policies. Bolivia’s is a hybrid approach: mixing an alternative democratic tradition domestically with the promotion of Bolivia Inc. globally. It is past time for Washington to move on from its one-size-fits-all approach toward Andean countries, and to take more seriously the perspectives and priorities of their peoples and governments. And Bolivia’s recent history provides ample opportunity for the U.S. to identify common – if not identical – ground. 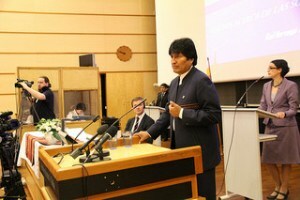 Morales’s frequent statement that Bolivia is looking for “partners, not bosses” echoes President Obama’s own 2009 speech about “partnership” in our hemispheric “neighborhood.” Obama’s recent inaugural call for more effective “collective action” resonates with the spirit of Bolivia’s ongoing plurinational democratic experiment. And if climate change is back on the U.S. political agenda, Bolivia continues to be a global catalyst for this important multilateral discussion. Emphasizing these shared problems, experiences, and aspirations, can provide a foundation for closer relations. How many of Evo’s cabinet members are indigenous? Evo himself even said that he doesn’t consider himself to be Bolivia’s first indigenous president, but rather the first sindicalist president (meaning that he is a cocalero first and foremost). The real people in power, Garcia Linera, Quintana, Romero, Llorenti are not indigenous. Thanks for your comment. The key point here, I think, is that when considering U.S. policy toward Bolivia, and in contrast to Venezuela (with which Bolivia is often compared), the history and implications of indigenous political protagonism in that country is poorly understood, if at all. I agree that what constitutes indigenous empowerment in Bolivia is open to discussion, that Morales does not represent the entirety of that country’s variegated indigenous landscape, that what constitutes “indigenous” is debatable, and that Bolivia’s president certainly has his indigenous critics. But, his administration is also responsible for the 2009 Constitution, granting significant political and economic autonomy to indigenous groups, and his government routinely frames its policy making in the terms of ongoing indigenous de-colonization. This certainly constitutes a historical shift toward the rights and concerns of the country’s indigenous peoples.